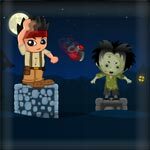 Use your tricks and skills to Fight Zombies and clean up Your City. A City which got attacked by Zombies and changed to doom. A Kid stands to Fight for it.Yes! It's You. use your tricks and skills to Fight Zombies and clean up Your City. All the best! Use "Mouse" To throw Bombs, water to push zombies into water , use jump to move to other side.